The Cipriani concept dates back to 1931 when Giuseppe Cipriani set up Harry’s Bar in Venice. It’s there where the famous Bellini cocktail was invented, as was the perennially popular beef carpaccio. Cipriani today is present in several cities around the world from London and Monte Carlo to Hong Kong and New York City. Here in Dubai, the franchise comes under Bulldozer Group, which has already imported international concepts like London’s celebrity-friendly Novikov and Monte Carlo’s Sass Café to the city. 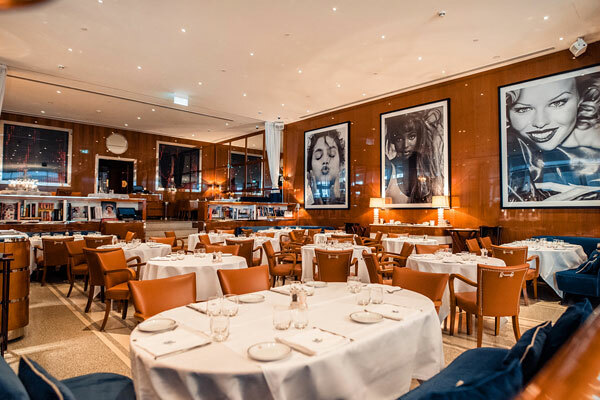 Cipriani, with its white tablecloth service, Murano glass chandelier and nautical theme with veneered wood surfaces is fittingly upscale for the DIFC Cartier-cufflink and Prada-heeled office crowd that does business in the area during the day. The zucchini crisps arrive while we wait for our scampi and calamari fritti, which includes fresh and crisp seafood with only the slightest amount of citrus, required to elevate the flavour. While you could stick to Italian and order a pizza with buffalo mozzarella made in-house, you can’t go wrong with the baked green taglioni with veal ham. If there’s just one main course dish that Cipriani could claim as its own – much like carpaccio or the Bellini – then it has to be succulent, tender scallops served with lemon and capers and a side of pilaf. For dessert, don’t skip the Cipriani vanilla meringue – a restaurant that prefixes one of the desserts with its own name is confident that it will be its signature option– and it doesn’t disappoint.